Conflict and climate change will continue to acerbate the global refugee crisis in the next three decades. It’s time we considered migration a human right. Nazry Mustakim married his wife Hope, a U.S. citizen, in 2008. They owned a house in Fort Worth, Texas, and he had a stable job and paid his taxes. Then, one day in 2011, Immigration and Customs Enforcement (ICE) officers showed up to his house and detained him. There were some problems with his immigration status, they said, and he needed to go to court and make bail. “They made it sound so simple,” Nazry told me over the phone. He was taken to the Waco, Texas ICE detention center, where he was told he would have to be held for the weekend. Next, he was transferred to a facility four hours south of Waco, where he was placed into a detention center with other immigrants. Nazry Mustakim was born in Singapore and came to the U.S. in 1992, when he was only 13. His mother had married an American, and later, sent for he and his sister to join her. He and his sister were given status as permanent residents. In 2005, Nazry was arrested for possession of marijuana and methamphetamines. He pleaded guilty to felony possession charges, and didn’t spend any time in jail. Instead, he was sentenced to rehabilitation and required to regularly check in with a probation officer. In the wake of his sentencing, Nazry began to rebuild his life. He met his wife and got sober. But six years after his youthful mistake, a prosecutor began deportation proceedings against him. Under U.S. law, green card holders who commit felonies can be removed from the country. When Nazry was handed three sets of clothes and a bed sheet at the detention center, it occurred to him that he might not be going home any time soon. He was right: he ended up being detained for 10 months. Nazry’s wife, Hope, fought tooth and nail for his release, and led a public campaign to free him. His case was finally resolved when a clerical error caused the evidence against Nazry to go missing. He was released from the detention center in 2012. Since then, the couple has had two children, and the family now lives in Waco, Texas. Not every immigration case has a happy ending. Over the past 20 years, the United States has constructed the largest immigrant detention infrastructure in the world, detaining 380,000 to 442,000 people each year. 2.3 million people have to regularly check in with the immigration equivalent of a parole officer. It is estimated that about 2 million of these people are innocent of any criminal offense. How did we get here? Migration itself is not new. Life on Earth has been migrating long before humans began navigating massive swaths of its surface. It’s natural. All species do it in order to escape harsh weather, to find food, and to ensure survival. In this context, the United States of America is relatively new, built through hundreds of years of migration, both forced — the displacement of indigenous peoples, whose land was stolen from them, and the arrival of African people oppressed into slavery — and voluntary. The words inscribed on the Statue of Liberty, a symbol as synonymous with this country as its flag, welcome those coming from other countries openly. That sentiment has sounded hollow for a long time now, even before Trump became president. The United States doesn’t stand alone in this attitude towards immigration. Nationalist rallies across Europe, and acts of violence and racism towards immigrants in cities like London, Paris, and New York, point towards a global rise of right wing nationalists. There is an unjust system that determines who gets to migrate safely, and it is a system that mirrors many of the systemic forms of oppression that are based on race, class, and religion, among other markers of identity. What if there was a different way of legislating migration? What if the United States didn’t have an entire prison infrastructure just for immigrants? What if people migrating from Eritrea, Sudan, and Ethiopia could do so without being sold into slavery? What if safe migration wasn’t treated as a privilege, but rather, as a human right? Migration as a human right is a concept that has been gaining legitimacy in academic and advocate circles over the the past 10 years, in response to the growing refugee crises all over the world. It’s a sincere policy proposal in the face of massive displacement caused by conflict, climate change, and diminishing economic opportunities. Though not everyone agrees it’s the right solution, it is an idea that many keep coming back to: Creating a global doctrine classifying migration as a human right would challenge societal concepts of class, race, and mobility. If anyone could go anywhere they wanted, if everyone had the opportunity to move to a place that was safer, where there were more jobs, and they faced less persecution, then systems of oppression would become less powerful. Migration as a human right is an especially revolutionary idea in a time when the security of a country’s border seems linked to national identity, and nationalism is experiencing a renaissance globally. “Immigration restrictions curtail freedom,” argued Kieran Oberman, a professor of political theory at Edinburgh University, in a 2013 paper he wrote titled “Immigration As A Human Right.” Oberman argues that if a country were to impose the restrictions and laws designed for immigrants on to its own citizens, that country would face global condemnation. A society that truly prides itself on ideals of freedom and liberty would make immigration restrictions illegitimate, he asserts. The need to radically rethink our rights around immigration is urgent. In 2015, the United Nations Refugee Agency (UNHCR) reported that 65.3 million people around the world were displaced that year — and that’s only going to rise. “We are having this horrible conversation about a border wall, and at the same time we’re not understanding how climate is impacting the communities that are forced to be making the decisions to move north,” said Professor Maxine Burkett in a phone call with The FADER. Burkett is a fellow at the Woodrow Wilson International Center for Scholars, and a professor of climate change law at the University of Hawaii. By 2050, there could be as many as 200 million climate migrants. While that specific estimate is disputed, it is largely agreed by climate scientists that climate change will cause massive migration in the future. Those migrants will include vulnerable populations from all over the world, including the United States. Many coastal regions of the U.S. are slated for a similar fate based on most projections. New York City is extremely vulnerable to pending climate change, and Florida is literally going to disappear as the sea level continues to rise. As more and more Americans become climate refugees, will the perspective on migration change? Climate change won’t be the only factor contributing to increased number of migrants. Conflict, which already accounts for a huge number of displaced people, likely won’t lessen in the coming years. Violence in countries like Syria, Afghanistan, Iraq, and Venezuela will continue to produce displaced populations, while the future of diplomacy remains uncertain in the face of unstable leaders like Donald Trump and Kim Jong Un. At this point, the United States is far from recognizing migration as a human right. Attempting to imagine what that would look like seems impossible when ICE is the most funded federal law enforcement agency in the United States. The current administration is going beyond the unprecedented numbers of deportations under Obama era policy, and intensifying violations under current international human rights standards. These sentiments coincide with the endless headlines about ICE officials detaining and deporting people in the U.S. In September, the parents of an infant undergoing surgery were arrested while the child was still being operated on. Days later, a man with three children, and whose wife was pregnant, was arrested during a routine ICE check-in. On a daily basis, fear and intimidation dictate the way the United States addresses immigration issues. 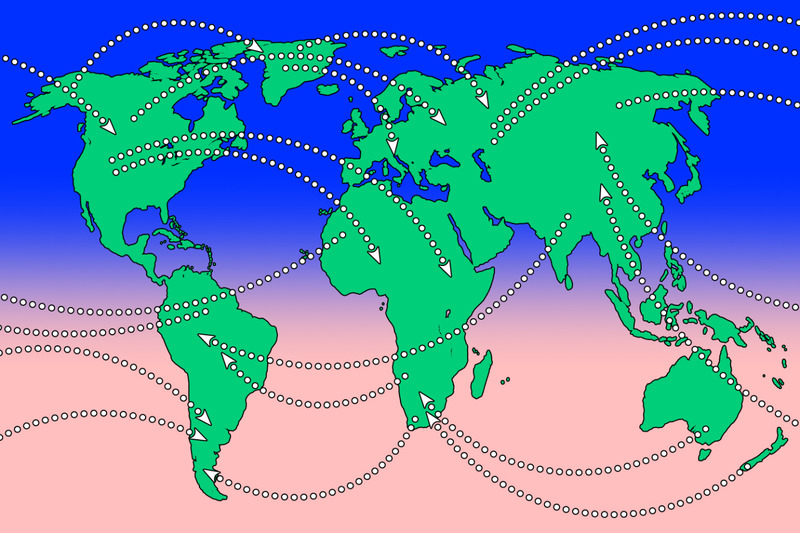 Would migration as a human right actually work? One of the major problems facing any future move towards making migration a human right is that human rights experts do not agree that it would solve the problems facing migrants today. Some argue that such a move could be rendered irrelevant by governments who already violate the existing human rights doctrines put forth by international governing bodies. “I don’t think we need more rights, I think we need better enforcement of the rights that we already have,” said Alison Brysk in a phone interview with The FADER. Brysk is a professor and chair of the global studies department at the University of California. She explained that before adding another human right to international doctrines, the rights already established should be respected by U.S. immigration laws. Perhaps migration should be a human right, but before that can happen, the 30 existing universally agreed upon human rights written in the Universal Declaration of Human Rights should be properly instituted. “A lot of the bitter experiences and abuse of experiences that migrants are facing, particularly in the U.S., are already covered by existing rights,” added Brysk, pointing out that while migration itself isn’t considered a right, there are a lot of rights attached to migration. The experiences Brysk refers to include the increasingly common occurrence of women who say they have lost their pregnancies while in immigration detention centers, the unidentified bodies in mass graves in the arid land between the U.S. and Mexico, the privatization of detention centers turning a profit while inmates hang themselves, and countless stories of ICE terrorizing communities with raids and arrests. In recent situations where deportation causes harm, is the United States at fault? When Juan Coronilla-Guerrero was arrested, his wife warned that returning to Mexico would be deadly for him. Within days of returning, Coronilla-Guerrero’s body was found 40 minutes from his village. He had been murdered. A first step in securing the rights of migrants lies in the work of activist groups. Groups like the New York Immigrant Coalition fighting against ICE deportations, and the Dreamers, who interrupted Nancy Pelosi during an insincere press conference about border walls, continue to battle aggressive government policies. There’s hope in the ships, like the Aquarius, rescuing migrants from the Mediterranean, and in the Canadian families accepting Syrian families into their homes in response to the mounting refugee crisis in Syria. “Safe migration cannot be limited to the global elite,” said Antonio Guterres, Secretary General of the United Nations, during a UN General Assembly in September 2017. He’s right. An economic bracket, a religion, or a skin color should not determine a person’s ability to pursue an opportunity for a better life. When migration is restricted, nationalism, racism, and classism are allowed to thrive. If migration was a human right, perhaps those oppressive systems could start to be dismantled.